Debut author Ashley Dyer is the pseudonym for the writing duo of Margaret Murphy and Helen Pepper. Murphy is a published writer of psychological suspense and past chair of the Crime Writers Association. Helen Pepper has been an analyst, forensic scientist, scene of crime officer, CSI and crime scene manager. 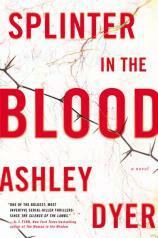 When I see their first novel, SPLINTER IN THE BLOOD, receiving comparison to THE SILENCE OF THE LAMBS, I can buy into it based on the pedigree of their combined experience. I absolutely loved this novel and can highly recommend it to fans of both the serial killer and forensic crime genres. The set-up is unique. Lead detective Greg Carver is found in his home by his partner, Ruth Lake. Carver has a bullet lodged near his heart but is still alive. Instead of calling for help, the first thing Lake does is wipe down the house and collect all evidence of Carver's obsessive search for the cold-blooded murderer known as the Thorn Killer. Readers are immediately made suspicious of Lake's intentions in doing this. "I absolutely loved this novel and can highly recommend it to fans of both the serial killer and forensic crime genres.... The finale is literally breathtaking, and the expected misdirection is in high speed overdrive for the showdown." That is the sort of literary misdirection Dyer is so great at. You can easily spend much of the novel obsessing over the identity of the Thorn Killer. I suggest you just give up those thoughts and let yourself go along for the ride. I guarantee that the resolution will be a nice surprise. Lake visits Carver in his hospital room, but he is in and out of consciousness and does not have much recollection of the events that landed him there. She is now taking over the Thorn Killer case as the lead detective and must not only get much-needed information from her partner, but also keep him from continuing to worry about the case and concentrate on getting better. As he begins to get back more and more of his memory, things will get quite interesting. Meanwhile, Lake is now laser-focused on the Thorn Killer, who has left a string of female victims, each tattooed from head to toe with potential clues as to who he might be and why these women were selected by him. She decides that she needs to bring on someone with both toxicology and anthropology background as a forensic expert. Her recommendation is Dr. Lyall Gaines, who is arrogant, pompous and immediately ruffles her feathers. However, when it comes to anthropology and how this may fit into the markings the Thorn Killer has left on each of his victims, Gaines is the perfect adviser for the job. The investigation turns up evidence that Carver, who has a reputation as a sexual philanderer, may have had a hotel tryst with the most recent victim of the Thorn Killer on the same night he was found shot inside his home. Lake must juggle both using this information to help with the case and maintaining the protection of her partner's good name. One of the things I most enjoyed about this novel is that Dyer does not introduce the Thorn Killer until almost 200 pages in. It allows for development of everything else that is going on while keeping up the mystique of this unique serial killer. Similar to THE SILENCE OF THE LAMBS, in which FBI agent Clarice Starling nearly becomes another victim of Buffalo Bill, Lake lands firmly in the scope of the Thorn Killer and may find herself too deep into the persona she has created to save herself from the demented maniac. The finale is literally breathtaking, and the expected misdirection is in high speed overdrive for the showdown. I can only hope that, even though their identities are clearly out there, Margaret Murphy and Helen Pepper continue to write novels as Ashley Dyer. It also would be nice to spend more time with these UK crime-fighters who make for a very colorful squad.